Google Chrome could not load the web page because accounts.google.com took too long to respond. The website may be down or you may be experiencing issues with your Internet connection. Check your Internet connection. Reboot any routers, modems or other network devices that you may be using. Add Google Chrome as a permitted programme in your firewall or antivirus software’s settings. If it is already a permitted programme, try deleting it from the list of permitted programmes and adding it again. 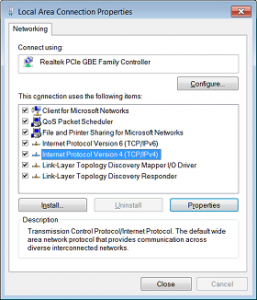 If you use a proxy server, check your proxy settings or contact your network administrator to make sure the proxy server is working. 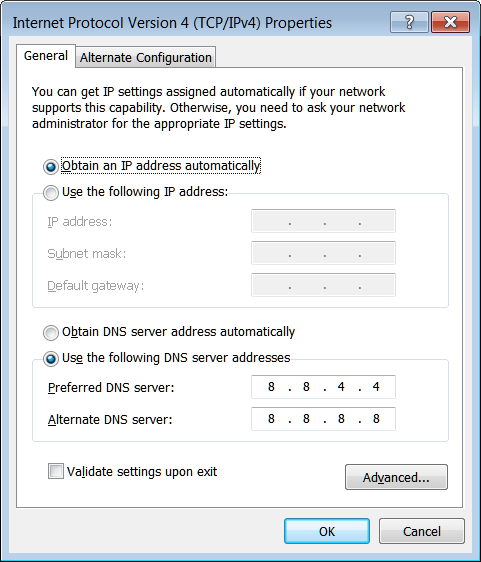 If you don’t believe you should be using a proxy server, adjust your proxy settings: Go to the Chrome menu > Settings > + Show advanced settings > Change proxy settings… > LAN Settings and deselect the “Use a proxy server for your LAN” checkbox. Error 118 (net::ERR_CONNECTION_TIMED_OUT): The operation timed out. 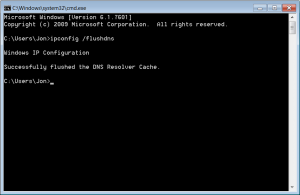 In my PC I have set the DNS to use Google DNS. 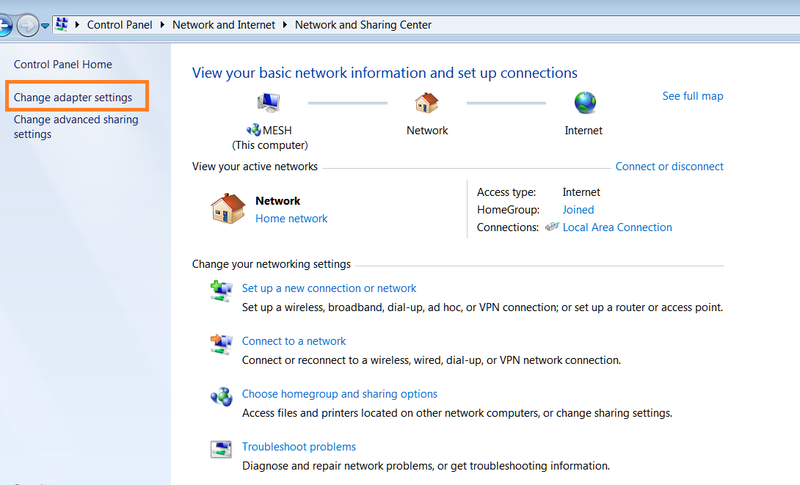 This is done by going to your Windows Control Panel > Network and Internet ? Change adapter settings (this option is on the left nav bar, see screenshot). 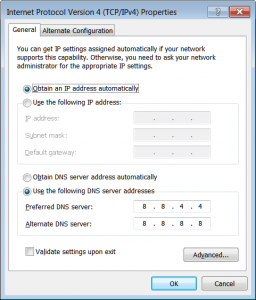 In the last to boxes of the IPv4 window there are Prefered DNS server and Alternate DNS Server. Change these to 8.8.4.4. and 8.8.8.8. as shown. If there is something there now, take a note, just in case you need to put it back. So, now your computer will use Google DNS. I have found that this causes fewer problems, but I am still getting the errors. The other thing I do, which generally works, is Flush and Renew DNS in the Windows Command Prompt. To open the Command Prompt you can just hold down the Windows key and press R (Win-R) which brings up the “Run box”, then type cmd and hit OK. This will open the box. Alternatively you can find it with the mouse from Windows Start > All Programs > Accessories. If you keep the Command Prompt open all the time in the background, as soon as you get these network / Internet problems, you can open the Window then press the up arrow once to get the last command you typed (i.e. ipconfig /renew) and then hit enter. And then press the up arrow twice to get to the command before that (i.e. ipconfig /flushdns). On the rare occasion that this does not “fix” my Internet problem, I have rebooted the Router, or sometimes if desperate, run CCleaner, and failing that, rebooted the PC. Although maybe, I have not had to do that since adding the Google DNS. Is this a perfect solution? No, of course it isn’t! I have recently changed ISP – now have BT Infinity. Since moving to BT I have not had a single Internet problem. Tempted to remove the Google DNS to see if it all still works. If so, then I know it was the previous ISP causing problems. Delete the hosts file? Open Facebook? Huh? Feel free to explain why it will work. There was a virus that was specifically targeting Facebook, inserting information in the hosts file to block the access of the website. Therefore a common problem recently about recurring error 118 is about this problem as Facebook is essential for some people. As for your solution, great idea about using Google DNS, I’ll try it out. Thanks~! I tried your solution to use the Google DNS and it’s now fixed. so what is the prob and how to fix it? Google DNS worked for me. I’m so excited that I’m not getting these errors. Thank you. I have tried everything and nothing works for me, i get the “ERR_CONNECTION_TIMED_OUT” error when im trying to typing my ip in the web browser. Sorry, but I don’t know what to suggest.